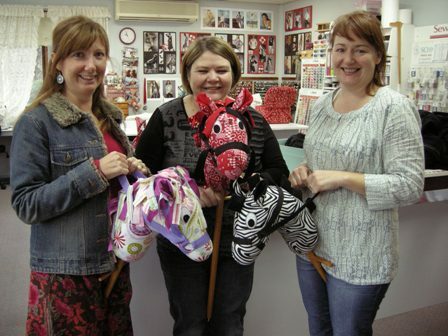 Here are some more sewing projects that have been made in my sewing school here at Rosewood Cottage! Below is Melanie (left), Meagan (centre) and Kate (right). 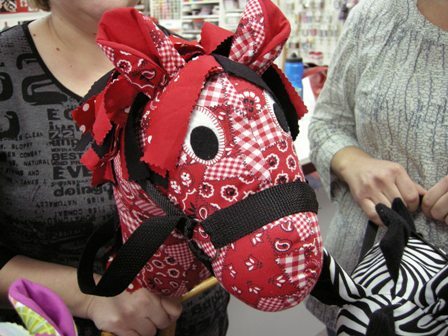 In sewing classes Meagan began with making clothes for herself and family and then had the idea to make hobby horses. 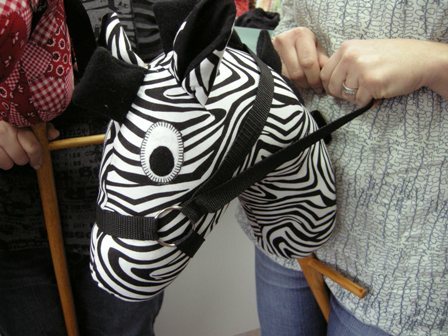 Meagan now sells these gorgeous hobby horses in various shops and outlets as well as direct to customers. Lois made this gorgeous black and white shirt from a Butterick pattern B4659. It features a winged collar neckline, princess line seams, two sleeve variations and two different lengths. Fabric used was a stretch polished spandex cotton. A twist top! Glenda made a twist dress for her sister from the pattern New Look 6802 which was a great success. Glenda found she had a large piece of the fabric remaining and as she likes to use up all her remnants, I suggested she make herself a twist top from the same pattern. So here you can see the result of the printed remnant coordinated with a black jersey knit. Great Job Glenda! I hope you have enjoyed this blog post to view some of the garments and projects being made in my sewing school! If you would like to learn how to sew contact me today! If you liked this blog please leave me a comment below I would love to hear from YOU! !